Hoai-Nam Nguyen is many things to many people. In Vietnam, Nguyen is a walking embodiment of freestyle football. To an expert like Mr. Woo, he’s one of the most natural performers to grace the stage. And to a working pro like Palle? It might be that Nguyen is simply a good friend, someone who’s traveled the world to spread his passion for a sport. After conquering the ranks of the sport, he then returned to his homeland of Vietnam and along with his cousin, became the driving force to bring freestyle to a country that was already football crazed, but regarded soccer tricks as more circus act than competitive sport. He’s also had his own travel/culture/sport reality TV show. We caught up with the multi-hyphenate pioneer about his glory days in competition, and the tireless work he continues to do developing freestyle in Asia and beyond. Urban Pitch: You have a very interesting background. Can you tell us how you grew up and how that shaped your perspective on the world? NTM: My parents were part of the boat people, if you know a little bit of the Vietnam War. So they ended up in Ireland and met there, and married. Interestingly, I found out recently I was the first Vietnamese person to be born in Ireland. I grew up in the west of Ireland, the city was called Sligo, a very small city. And they were stationed there, and you know adapting to the new culture and environment wasn’t so easy. But to be exposed, I suppose, to the Irish and European culture as well as having Asian culture at home, I guess it gave me and my siblings the chance to experience almost like two different lives. So I think in a way that kind of opens up your mind about the world. From then on, I ended up in Dublin and lived there for 20-plus years before I started to travel because of the sport, freestyle football. That’s crazy you were the first Vietnamese person born in Ireland. Haha that is crazy, huh. My name it’s a very typical surname, Nguyen. But the first two names of the Vietnamese individual is very important. My name is Hoai-Nam and the reason why my parents named me Hoai-Nam is because it translates to ‘always remember the homeland,’ or ‘never forget Vietnam.’ So that played a part in freestyle football because I moved back to Vietnam in 2010 to develop the sport and inspire people to take up freestyle. I was very interested in “inventions” or becoming a scientist to make up creations that are imagined from the mind. I opened up my remote-controlled car the first day I got it and took it apart. That was the kind of kid I was. 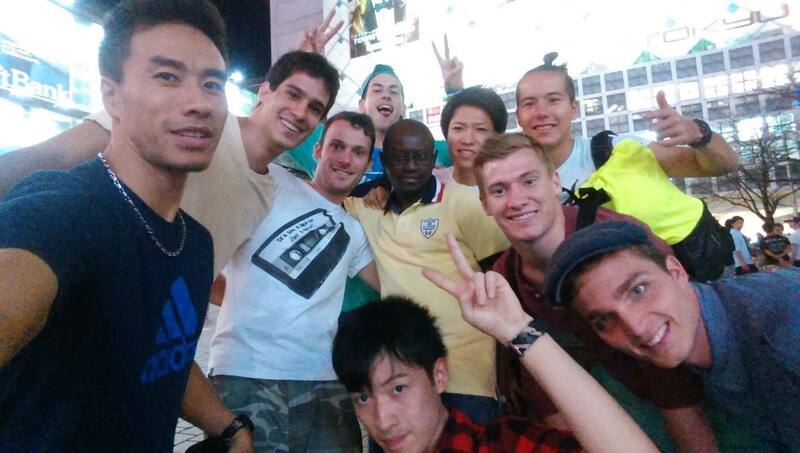 Nam the Man (left) with fellow freestylers in Tokyo, Japan. 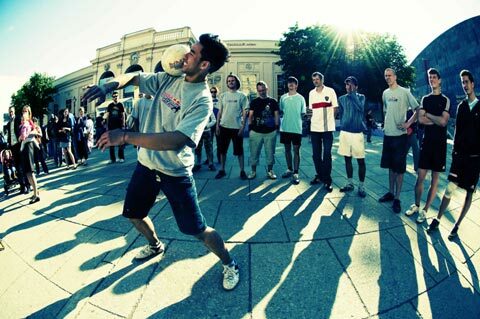 How did your parents feel when you were like, ‘Mom, Dad, I want to be a professional freestyler’? The majority of Asian parents they want their kids to have a secure future, a good education, to have security. For me, I studied engineering and I acquired my degree in electronics. I gave it to my parents to keep them happy, and then I said, okay, now I’m going to follow what I want to do. I want to be a football player. So I went so far as to become a semi-professional football player with my university club in Dublin. Midfield. So I got to the semi-professional level, and it wasn’t so easy because Irish people are quite physical … but I trained really hard and I did manage to go back to Vietnam to train with the U21 Army team, which is the national team, but the conditions were not right for me. It’s really cold and rainy in Ireland, when going back to Vietnam where the weather is very humid, very hot, I couldn’t last 10 minutes. 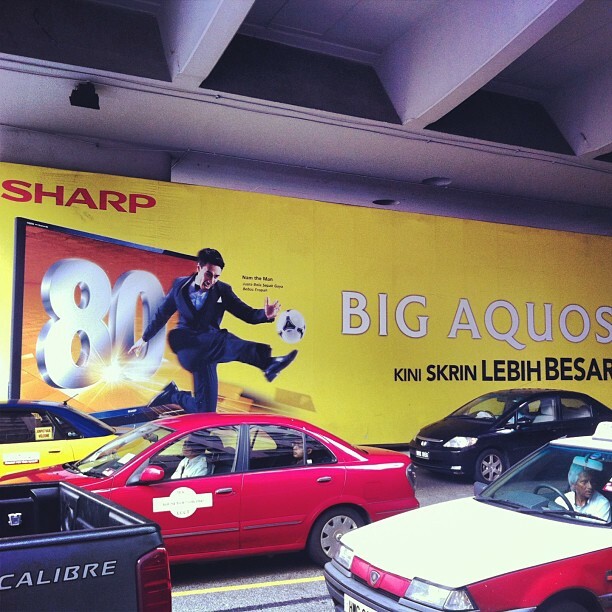 I still play it casually—futsal, street soccer, and on the field. When did you start picking up the ball, I’m assuming you were pretty young? I used to play a lot of street soccer. And street soccer, it’s not like the street soccer today where you’re always looking for the panna, where you’re doing all these fancy skills. It was really like playing on the concrete and using your surroundings. From there, a lot of my friends balanced the ball on their forehead or on their knees. So I picked up those tricks. We didn’t term that freestyle, it was just football skills. It was not until 2001 to 2003, when Nike swept the UK and Ireland with their campaign, Freestyle Skills, that’s when I got more involved. I was then 21. I studied engineering, and it was really tough, like 9 to 5 every day, like a full-time job. And for me to release that stress it was through kicking a ball at lunch time. I’d go to the sports hall and I’d try to get a pickup game or if there was nobody there, I’d have a ball to myself and I’d be juggling. It was from that hall that I started to develop more football skills and freestyle skills. I started to go full time just after I got my degree, and things just started to open up from then onward. That’s amazing that you got serious with freestyle when you were in college to release stress. It’s also like I developed a passion for it. I just really loved it because you’re training hard at a trick and sometimes it can take days to nail a certain trick. So, you know, there’s a great sense of satisfaction when you nail it and you go to the next trick. You wanna learn and you’re lying in bed thinking about the next trick, trying to create a trick, and you try to realize it through training and training until you get it. For me, it was really addictive. It was like a drug. Do you think freestylers have to have a certain personality. I don’t know what the right word is, maybe obsessive? What’s that term when people are really hyper? Yeah, most of the freestylers I know have got that, haha. I don’t think I’ve got that, but most of the freestylers I know have got a lot of energy. One freestyler in particular, Dan Magness, has got that, and that’s why he’s the world record holder for doing keepy uppies for the longest period of time. He uses that [energy] for his freestyle. For everyone, I think it’s a bit different. I guess it’s just passion, I suppose. NTM performing where he enjoys it the most, on the street for the public. When you’re freestyling, when do you feel the most sense of satisfaction? Do you get a feeling of euphoria? There was one time when I was training, and I was just training uppers, I was doing that lying down, not standing up. And for me the time just flew by. I trained five hours straight and I didn’t realize it. It was like 5 minutes, for me. I was enjoying it, listening to some music. I guess you just lose a sense of time sometimes. The first time I was there, I was really shy, and I didn’t want to do it. What would people think? I also did a lot of street performing. There’s a street in Dublin called Grafton Street, and it’s pedestrianized so they welcome artists and performers. The first time I was there, I was really shy, and I didn’t want to do it. What would people think? If my Asian friends or parents or uncles and aunts, if they see this guy’s begging on the streets and whatnot, you know? But my Irish friends were like, just do it. So one day I was like, I’m going to do it, I’m going to do it. And I ended up testing one night. It was like a Monday night at 8 p.m., and I thought okay, not so many people. I had no music. I had a ball and a small little bucket, I call my lucky bucket, and I just placed it on the ground and I started doing freestyle football. I made the equivalent to 100 U.S. dollars within an hour. And it was from that point on that I thought, oh, this could be interesting. So for me, I felt so comfortable performing on the streets for the general public, just randomly freestyling, than I do performing on the stage. 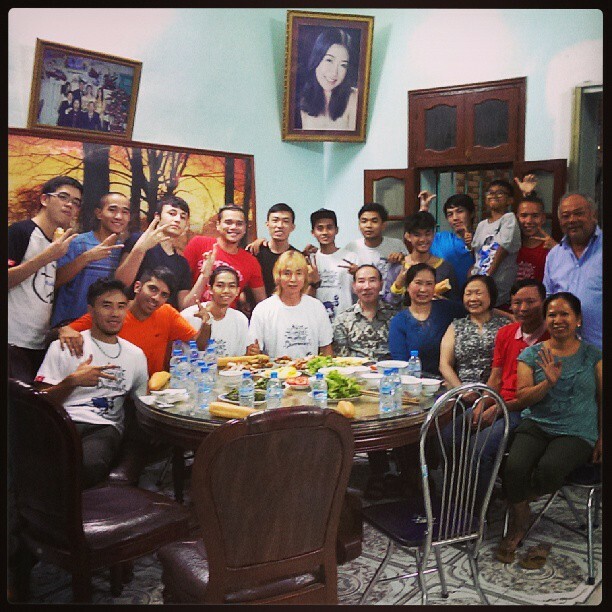 NTM at home in Vietnam with fellow freestylers, including Mr. Woo (center), who participated in the first-ever Asian Championships, 2013. Were there certain people that really helped you develop your skills, or any mentors that you had along the way? Back in that time, Facebook and Youtube didn’t exist. At that time, it was Mr. 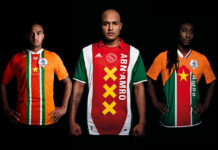 Woo, Abbas Farid, and the Dutch guys, like Soufiane Touzani and Nelson de Kok—those guys really inspired me. And alongside that, football players like the likes of Maradona and Pelé, Ronaldo of Brazil and Ronaldinho, Edgar Davids of Holland. I’d seen them on TV—the Internet wasn’t a very big thing, it was just starting. So you’d have to glue your eyes on the TV during the World Cup or the European Championship and you’d see these cool advertisements with freestyle football in it. A lot of people comment on your creativity as a factor that sets you apart. What’s your particular style and what are you influenced by? I don’t know why, I guess it’s because I did this video that was very acrobatic. So I grip the ball on my foot and I do this mix of acrobatic and b-boy move, it’s called the Mega Magnetic Mix, and then I do a tumble. I’ve always thought of mixing martial arts and acrobatics, and even b-boying with freestyle football. So I don’t know, people classify it as creativity. It’s just gripping the ball and doing a movement. There’s another one where I’m sitting down and the ball is gripped under my calf and hamstring and I pop the ball straight up and kind of do a flip up then I catch the ball again. I mean back in that time, that was being creative I suppose, and then I was just really tagged with that word, being creative. But I’ve always thought of mixing martial arts and acrobatics, and even b-boying with freestyle football. And then you see the likes of the S3 guys, they take it to another level. It seems we’ve seen you freestyle in almost every location imaginable—in the town square, on stage with cheerleaders, in a cave, in a bear costume … Is there any place (or scenario) you have yet to perform and would like to? I have always dreamed of performing in an action scene alongside or even against Jackie Chan using the surrounding obstacles on a movie set for an upcoming blockbuster film based on football and spies haha! I grew up watching his movies, and wherever he was he’d look around and then he’d use his surroundings to create different movements and choreography. So in the same way, I thought why not try to mix different types of sports and acrobatics and dance and whatnot into freestyle football. I kind of showed that through my Komball contest, which was the first major competition I entered in 2008. Can you take me through that day? It looked like you were in total shock when you beat Séan Garnier and won the competition, but you were also performing very confidently. To explain that, I have to give you some background. 2008 was a year, but 2007 was what prepared me for 2008. In late 2006 to 2007 I was hospitalized a lot and it prevented me from training. It affected my legs mostly. It was quite serious. I was 27, 28 then and I’m just going around kicking a ball, you know, what are you doing with your life kind of thing. So 2007, it was difficult for me, but I did manage to get the chance to travel to Japan for three months for Monta (a brand dedicated to street soccer and freestyle), alongside freestyler Palle from Sweden. On a personal level, I had to choose between doing that and really settling down and getting a real job. Because I was 27, 28 then and I’m just going around kicking a ball, you know, what are you doing with your life kind of thing. So it was really difficult at that time, but I thought, you know what, this is a once-in-a-lifetime kind of thing, this is something money can’t buy, I’m going to go to Japan. So I did, and for three months we focused, we trained a lot, and my friend Palle in a way motivated me. He was very health conscious and he freestyled 24/7, so I trained and trained and come 2008 it was in March that event happened. I was invited, but I didn’t think much of it, I never expected to win from the 16 players. A lot of people classify it as the European championship but I see it as the world championship because we had current world champion at that time Jon Farnworth, former champion Mr. Woo, and future champions like Szymo from Poland. And I don’t know, round after round I just didn’t think, I just did what came naturally to mind. And from round after round, I showed different tricks, and the judges noticed that. It was 2 to 1 by the way, but Séan was unlucky that he dropped the ball twice, and things just went my way. It sounds like you were in the zone. I was I suppose. It was just like training, you know. When you’re performing on stage sometimes, you think, okay, I’ve got three minutes—I’ll do this, I’ll do that, and after that I’ll do sit-downs, I’ll do air moves, and then when you make a small mistake you think, oh no, I lost it. Whereas when you’re performing for people on the street, you go with the flow, mentally and physically. And that’s how I was—really in the zone. 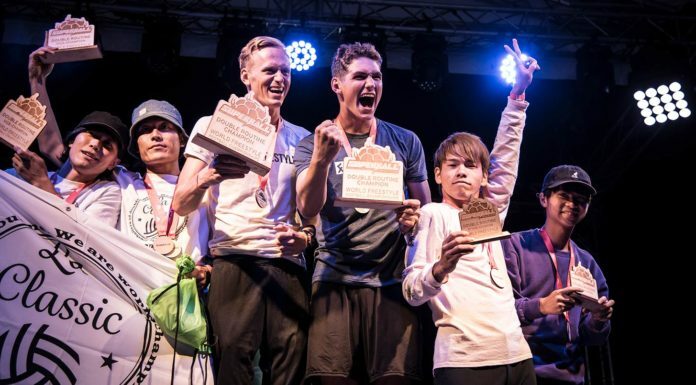 After the Komball you won two more championships—the Red Bull Street Style European Championship in Austria and Red Bull Street Style European Championship in Ireland. It was also like a trial for Red Bull because most of the players involved gave them a lot of feedback. They wanted to develop from Red Bull Reaction from South America and rebrand it as Red Bull Street Style, so it was the very first Red Bull Street Style event ever, and it was only two months after the Komball competition. My manager advised me not to compete because I’d lose my other title, but I said I’m going to join anyway, this doesn’t happen every year. So I went with it. And again, I was just there, I was in the zone. I was really happy to meet all the other world-class European freestylers, and I guess luck was on my side there, too. Edgar Davids was one of the head judges, and he presented me with the trophy then, and I was quite happy with that. The Irish Red Bull Championships, I did that the same year, but we were only like eight players in that. We had to import players from England based on the fact that their grandparents were Irish. And I was lucky to win against Daniel Dennehy, another world-class player of his generation. And I went on to represent Ireland in the Street Style World Finals. NTM shooting in Bangkok, Thailand. After these major titles and experience I felt I wanted to move on to try something else. I thought, you can’t be the best forever, and you can’t win competitions forever. And I have to make room for the new generation. So that brings me to where I am. I wanted to inspire and grow the sport in Asia and thought where best to plant a seed, it was Vietnam, my home country. I moved to Asia in 2010 and I became more involved with TV and media which led to many commercial gigs. I now represent Asia for the Freestyle Football Federation (F3) as the Secretary General, so I do everything—from marketing to communications to setting up meetings, getting sponsors, logistics of managing international players coming to events—I do a bit everything. I like to put myself in the deep end to learn along the way and connect with people. I have managed to realize the Asian Championships for three years now in three different countries, namely Hanoi, Vietnam, Kuala Lumpur, Malaysia, and Jakarta, Indonesia. I hope this year will see the Asian Championships be hosted in Davao, in The Philippines. It is a real challenge as hosting in different territories introduces new challenges each and every time. The reward though is bringing athletes from across Asia together and meeting and creating champions, which will be life changing for the individuals and most importantly to inspire the new generation. To find out more about Nam the Man, check out www.namtheman.com.